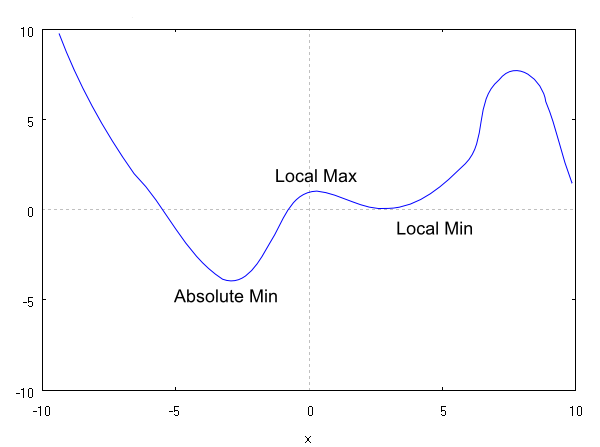 Maxima and minima are high and low spots on a function, respectively. Collectively, they are referred to as extrema. An extreme can be either local (the highest/lowest spot on an interval) or absolute (the highest/lowest point in the whole function). Extrema are easy to find with calculus; they always occur where the first directive is equal to 0. Concavity refers to which way a function opens on some interval. A function can be either concave up or concave down. 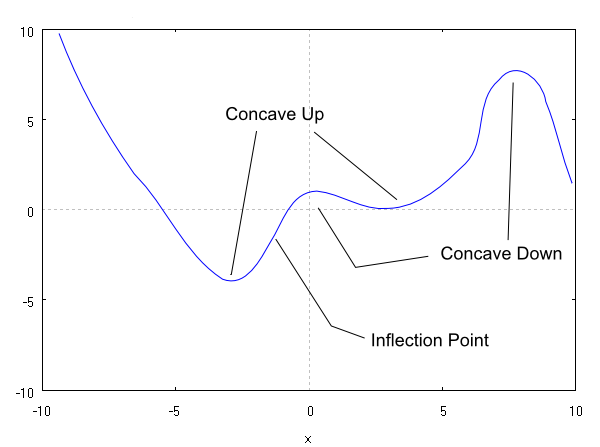 A point where concavity changes is known as an inflection point. A function, f(x), is concave up on an interval if and only if its first derivative, f’(x) is increasing on that interval (i.e. f”(x) > 0). A function, f(x), is concave down on an interval if and only if its first derivative, f’(x) is decreasing on that interval (i.e. f”(x) < 0). Inflection points occur on a function wherever the second derivative is equal to 0 (f”(x) = 0). Shenk, A. (1988). Calculus and Analytic Geometry [4th Ed.]. Glenview, IL: Scott Foresman and Company. Swokowski, E., Olinick, M., Pence, D. & Cole, J. (1994). Calculus of a Single Variable [6th Ed.]. Boston, MA: PWS.